Yesterday evening, i had a problems with a website that i’m updating. On about midnight, i had finished to update that site, so, i try a couple of test with different browser.. If uploaded header.php file and make some test we can see that those css are used only on IE8. ( for make some test with different version of IE , you can simply open IE9, go to the option settings ( on top right ), click on “tools for developer” and on top-right” of the panel that appears, you find “browser modality”, here you can rendere the page with the old versions of explorer ). 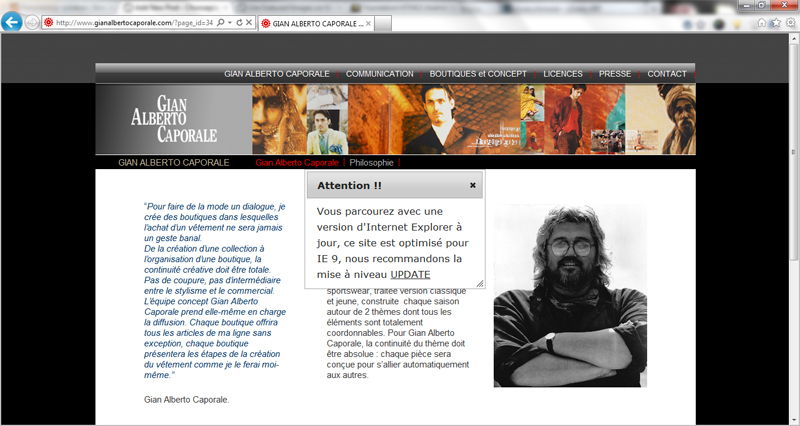 At the moment we had develop some css for adapting our website to the IE8 browser version, but we want that our website be viewing with IE9, so, how about show an allert window with a message that say to user that his version of IE is out of date ?and will be fantastic if the allert had inside the link for update IE. So, i can’t use the “allert” because it can’t contain html, so i use jQuery one more time. and add some script in jQuery function for show the allert to all users with IE8 only.